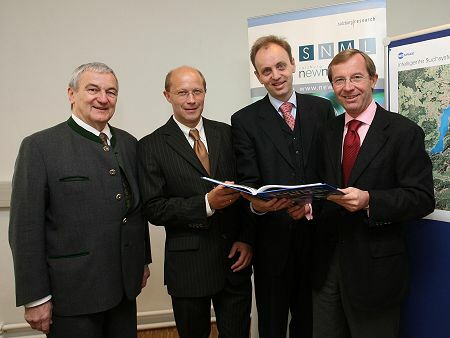 On 02.11.2006 the vice governor of the Province of Salzburg, LHStv. Dr. Wilfried Haslauer invited to a press conference to announce the three years prolongation of Salzburg NewMediaLab, the competence centre on digital content engineering I happen to lead. „On stage“ there were, besides Wilfried Haslauer, Siegfried Reich (CEO of Salzburg Research), Lothar Beckel (CEO of Geospace GmbH) and myself. We presented a summary of the last three years during which ten projects with an overall turnover of more that 2 million Euro were conducted and also announced the thematic focus of the prolongation phase (2006-2009): a combination of multimedia content management, semantic technologies and social software to raise the potential of digital content. L. Beckel, G. Güntner, S. Reich and W. Haslauer discuss the value of digital content instancing the use of analogue and digital satellite images.